Silicone lubricant must be used on all installations. 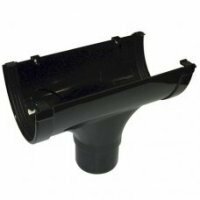 Floplast Xtraflo 170mm x 4m Gutter - Black Colour: Black Manufacturer: Floplast ..
Floplast Xtraflo 170mm Guttering Fascia Bracket - Black Colour: Black Manufacturer: Floplast ..
Floplast Xtraflo 170mm Guttering Union Bracket - Black Colour: Black Manufacturer: Floplast ..
Floplast Xtraflo 170mm Gutter 90 Degree Angle Colour: Black Manufacturer: Floplast ..
Floplast Xtraflo 170mm Guttering External Stopend - Black Colour: Black Manufacturer: Floplast..
Floplast Xtraflo 170mm Guttering Internal Stopend - Black Colour: Black Manufacturer: Flo..
Floplast Xtraflo 170mm Guttering Running Outlet - Black Colour: Black Manufacturer: Floplast ..
Floplast (SP3B) Black Soil Pipe - 3m Floplast 110mm Soil Pipes. Extremely durable solvent weld s..
Floplast (SP4B) Black Soil Pipe - 4m Floplast 110mm Soil Pipes. Extremely durable solvent weld s.. Description: 110mm stand off two screw pipe clip. With double fixing holes. Fix pipe brackets at ma.. Description: 110mm access pipe socket spigot screwed cap. Lightweight Access Pipe manufactured from .. Description: 110mm right angle bends 90 degrees spigot/socket. Lightweight Offset Bend manufactu.. Description: 110mm Soil Pipe Shoe. Lightweight Offset Bend manufactured from PVC-U for strength .. Description: Floplast (SP190B) Black Soil Branch 92.5 Degree. Ring seal boss pipe. Socket / s.. Description: Floplast (SP440B) Black 135 Degree Offset Bend - Top for use with Floplast 110mm so.. Description: Floplast (SP435B) Black 135 Degree Offset Bend - Bottom for use with Flopast 1..